NEW ORLEANS — Donald Trump’s unconventional campaign is about to feel the heat of political organization. Hillary Clinton and her Democratic allies have invested at least $41 million in commercials in crucial states such as Ohio, Florida and Nevada over the next six weeks, a series of summer broadsides against her Republican opponent. Those messages will be echoed by hundreds of Clinton workers in those same states and amplified by President Barack Obama and other top Democrats. Trump has made few preparations for contending with that sort of well-oiled political machine. His campaign has no advertising plans and is just now hiring employees in important states. Republican leaders are far from in agreement on how best to talk to voters about the polarizing billionaire, or if they will at all. And Trump is running out of time: Early voting starts in Iowa in just 3 1/2 months. Clinton’s large June and July ad buy comes as a reward for her near-constant fundraising. In May, she raised $27 million in primary election money that must be used before she accepts her party’s nomination at the convention in late July. Trump is playing catch up. He did not begin raising money in earnest until May 25, having largely financed his primary bid through personal loans to his campaign. Clinton’s latest spots, highlighting her past advocacy for children, are an attempt to reintroduce the returning presidential candidate — she lost the 2008 Democratic primary to Obama — to general election voters. 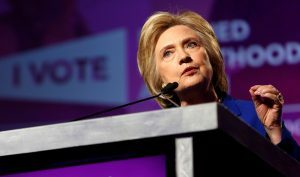 Her campaign is spending about $23 million on ads by the convention, according to advertising tracker Kantar Media’s CMAG. But those voters are also hearing from Priorities USA, a super political action committee financed by millions of dollars from Clinton’s staunchest supporters. The goal of those that $18.7 million batch of ads: cast Trump as a con-man and bully unprepared to be commander in chief. “When I saw Donald Trump mock someone with a disability, it showed me his soul. It showed me his heart,” says the father of a young girl with spina bifida, whose story is featured in one of the ads. It’s a strategy Democrats successfully used four years ago against Obama’s GOP opponent, Mitt Romney. Over that summer, Priorities USA relied on an intensely negative advertising campaign to define Romney as unconcerned with the worries of average Americans. Now, facing an opponent with far higher negative ratings and a weaker political organization, Democrats see an opportunity not only to retain the White House but make a strong play for winning control of the Senate and adding scores of Democrats to the House. In the past week, Obama, Vice President Joe Biden and Sen. Elizabeth Warren, D-Mass., have lined up behind Clinton. Her primary rival, Vermont Sen. Bernie Sanders, is expected to support her eventually. Trump has struggled to win over much of his party’s establishment and lacks that kind of a bench behind his message. Many top Republicans, including Romney and past Presidents George W. Bush and George H.W. Bush, do not plan to attend the party convention in July. Others refuse to answer questions about their nominee, largely leaving Trump to defend himself. “Donald Trump has people hiding under rocks hoping he doesn’t know where they are,” said New York Rep. Steve Israel, former chairman of the House Democrats’ campaign arm. For example, in critically important Ohio, where the state GOP backed Gov. John Kasich’s failed presidential campaign, party officials have been unwilling to throw much support behind Trump. Kasich, who had signed a pledge to back the Republican nominee, recently told MSNBC he “just can’t do it” unless Trump makes some significant changes. Marc Short, a Republican strategist who advised Florida Sen. Marco Rubio’s 2016 presidential campaign and previously led political operations for the billionaire Koch brothers’ network of conservative donors, said Trump would be in a far stronger position if he weren’t still getting organized. Trump, who has belittled the need for endorsements, has signaled a willingness to go it alone if he believes the Republican leadership is undermining him. “Republicans, either stick together or let me just do it by myself,” he told a rally this past week in Atlanta. Undeniably, Clinton’s long-cultivated donor network and commitment to fundraising gave her a running start on general election staffing. She began sending employees to Ohio and other states months ago. Trump, who plans to rely on Republican National Committee support, has few, if any staff singularly devoted to his campaign in any of the most competitive states. Clinton’s aides argue their early investment will pay off in the final weeks of the campaign. Data analyzed by Obama’s campaign in 2008 showed the enthusiasm of his supporters in the last six weeks was higher in areas where the campaign’s local operations got an early start, according to former staffers. Lerer reported from Washington. Associated Press writer Jonathan Lemire in New York contributed to this report.